Head of the Binyamin Regional Council condemns demolition in Netiv Ha'avot, urges leftist organizations to change their method of operation. 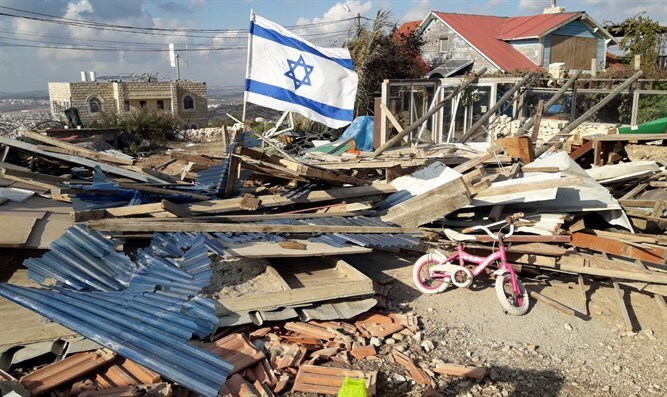 The head of the Binyamin Regional Council, Avi Roeh, on Thursday called for an end to demolitions and evictions in Judea and Samaria, in the wake of the demolition of the carpentry shop in the Netiv Ha'avot neighborhood in the Gush Etzion town of Elazar. "[Retired Supreme Court] justice Jubran has already said that it is possible to expropriate land in Judea and Samaria for the sake of the settlement enterprise. I think that should be the direction. Stop the demolitions because it does not contribute to anything. They destroy someone’s property for nothing,” he continued. Roeh, who in the past served as chairman of the Yesha Council, also spoke about the day of recognition for Israel’s wounded soldiers and wounded terror victims, in which a march took place in the Binyamin region and which ended on the ancient site of Shilo. "Unfortunately, the Binyamin Regional Council has suffered many terror attacks in which our residents were murdered and wounded, and every year the list gets longer and it hurts. I hope this will end, but despite the pain we also understand the magnitude of the task at hand, that we must expand and strengthen the settlement enterprise,” said Roeh.